Welcome to our table! At Amherst, you’ll be eating great meals with great friends. 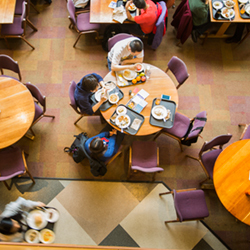 Our dining locations—from Valentine Hall to Schwemm’s Coffee House—are bright, cheerful spaces where you can settle in for real conversations. Our food is real too. 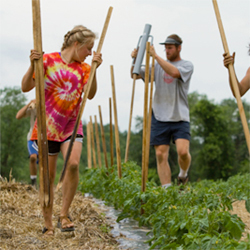 We use fresh, local ingredients, much of which comes from our Book & Plow Farm. Science Center Cafe - Coming Soon! How local is our locally-grown produce? 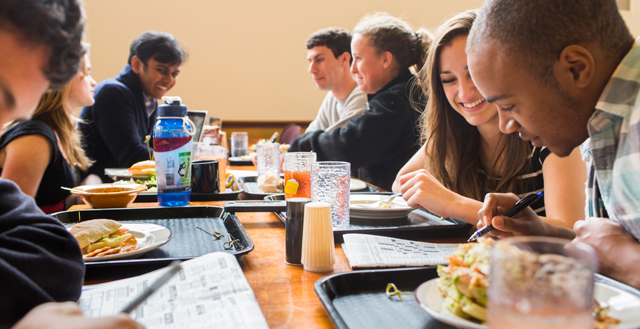 At Amherst College, you can barely break a sweat walking to where your salad came from. 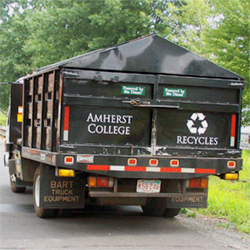 Amherst’s own Book & Plow Farm supplies Dining Services with a variety of fruits and vegetables, including carrots, onions, summer squash, kale, mustard greens, tomatoes, and bok choi as well as herbs and more. Learn the nutritional value of your food. Find options for specific diets, such as vegetarian or vegan. Sustainable dining is one of our top priorities, and we’re expanding our program all the time. We divert 84 tons of food waste per year. We’ve eliminated the use of 20,000 plastic bottles per year. We give unserved meals to local shelters and charitable organizations. 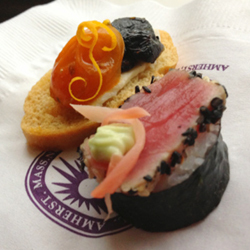 Don’t miss our students’ creative menu ideas on the Amherst Cuisine Facebook page!